These were first printed starting in 1908. Very few banks were still in territorial status at this late date. 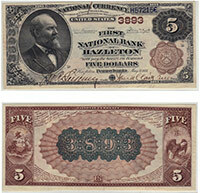 More than 100 five dollar blue seals are known to exist from all territorial banks. The large majority of those are from Hawaii and Alaska. Please contact us if you would like to know how much yours is worth. Don't forget to check the serial number. Number 1 notes always sell for nice premiums.